This is a very good work from 1956. 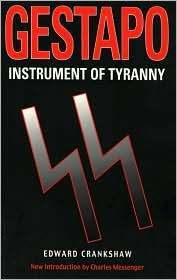 EC writes a study of the rise, fall and organization of the Gestapo. He gives enough detail to horrify but not so much as to get lost in a cloud of prurience. The meticulous creation of evil gives one a sense of numbed unreality. The Gestapo is so placid and accountant-like in its workaday routine. Banality of evil indeed. Crankshaw starts with the question “what is the worldview of people who could do this?” After describing the development of the Gestapo, EC takes every excuse for it in turn. He discards the Penguin Defense, Befehl ist Befehhl, and the “It's a German thing” defense. He concludes that the Gestapo arose from a mindset that refused to accept a non-ideal reality, a reality that includes others as they are. He spends time on the German educational system and on human nature in general. I think he ought to have paid more attention to the secularist, progressive politics that pervaded Germany after the 1880s. With no higher authority than the state, what stops you from deifying politics or science or reason or what have you? Did the modernist, secular, progressive destruction of all connections with the tangible past have the unintended consequence of dispensing with the need for civilization itself? This brought to mind Eric Hoffer's True Believer and Thomas Sowell's Vision of the Anointed. Both would be good books to pair with this one. All deal with the individual's surrender to the group in his search for ultimate meaning and how the believer/anointed regards those who stand over against his chosen ideal reality. This is a deep and prescient book. EC takes a more personal stance towards his subject than is the fashion nowadays. He at one point referred to Kurt Daluege as looking like “an affronted duck.” I have 2 copies of this book. A modern edition with a shiny black and red picture of Heydrich on the cover. My other copy is a paperback from 1956. It has a softcore cover with a lovely blond, hands bound behind her, on her knees before a uniformed, nightstick wielding Nazi. Have fun analyzing that one for yourselves. Another grim but good book. Extensively researched and footnoted, this book relates the history of the Gestapo from its formation early in the Nazi regime through the end of the war, and some of the trials of senior Gestapo officials for crimes against humanity after the war.A lot of it is matter-of-fact description of how the organization operated, from its structure to its policies. The unemotional accounts of the systematic, incredible, egregious cruelty of this psychopathic bureaucracy are more chilling for that very calm and unemotional telling.In the history of this as with other brutal power systems - including past and present aspects of my own American government - there are important lessons. If it's true for individuals that the unexamined life is not worth living, it's even more true for groups and whole societies. We should always be questioning ourselves and keeping an eye on our shadows. Most of the greatest evils perpetrated by groups in human history have been carried out by people who were blandly sure that what they were doing was right. When most people think of the Nazi regime, they think of the Gestapo as the source of all the horrible atrocities Germany is remembered for committing during WWII. This book shows that, although the Gestapo committed some of these terrible acts, it didn't commit them all--it shows the "other" groups within Nazi Germany that committed heinous acts of violence alongside, as well as above and beyond, the Gestapo. This book doesn't go as much into the actual descriptions of violence committed by Germany during this time frame as much as it tells the history of how these German groups and the Nazi machine came to be. It also takes a quick look at whether or not this could possibly happen again in another time and place. A great read for those interested in history, although it does read almost exactly like a dry history textbook at times. There is too much information to take in in one reading, but I was fascinated by it. It was written in 1956 and you can feel that the writer had serious questions about the Nuremberg trials. He pulls no punches when laying the blame for the Holocaust at the feet of the Germans as a whole as well as other nations who assisted in the atrocities. unspeakably disturbing. even knowing that the holocaust was horrific this one still made me feel sick reading it. however, its still a good book. at least if you like WWII history and are trying (in vain) to understand the nazis. Overall, a poorly written book. The content is there but the delivery is slow and disjointed. How the Gestapo fit into the fabric of Nazi Germany. This book would be a useful reference source were someone undertaking research on the period. Halfway through, I remembered I was no longer doing 'Higher' history and decided I could stop reading. Along with a sense of relief I also know where to go if I ever have to write an essay on the Nazi's police forces. This book is a bit of mess due to the power struggle between antagonists. No real surprises.